I don’t know when the idea of competing in a triathlon entered my head, but it happened some time after the end of my last long-term relationship, when I picked up the pace on my co-ed soccer team and shelled out a mound of cash for a three-year gym membership. Eventually I was working out five days a week. My heart was bruised, but I was in the best shape I’d been in in 10 years. But, I was a real novice and I didn’t know anything about endurance sports. The first mistake I made was to overtrain. I used to be a sprinter. I started competing at the age of 10 and ran up through my third year of college, where I qualified for the northern state championships. For five years I lived in Los Angeles without a car. For anyone who knows anything about LA, this is phenomenal. I rode my bike everywhere. And while I had absolutely no real experience swimming, I loved the water. On road trips, my parents used to stop at hotels with a pool just for me and I would swim out there all by myself, even in the middle of rainstorms. I have paddled out on a surfboard on some pretty big waves even though I can’t stand up all the way. Heck, a triathlon was in my soul somehow. Needless to say, I went down for the count, the count being six months and the threat of hospitalization. When I went back to the soccer team I was pathetic, and in my weakened condition my left knee gave out again. I had been playing and running and biking and skiing with a brace for 10 years – the result of an earlier soccer injury. Now I couldn’t lie to myself. My plans of being a contender were over, at least for a while. It wasn’t until three years later – after ACL replacement surgery and months of physical therapy – that I went back to running and the idea of a triathlon. So I volunteered to work at the Treasure Island Triathlon near San Francisco. I showed up at 6 am and guided racers and worked at aid stations, watching the people and checking out gear. I was in really bad shape, but I saw several people who looked in worse shape than I was and I watched them finish. It was amazing and awe-inspiring and humbling. These people weren’t concerned about time splits or winning. To them, winning was finishing, and inside my brain the light went on. So I joined up with the Leukemia & Lymphoma Society’s Team In Training program and, in honor of my beloved aunties, I began training 5-6 days a week. I committed. I had five and a half months to train for an Olympic-distance triathlon. To start, I had to completely kill my ego. I was used to being not just good, but being one of the best. Triathlons require pacing, patience and this relentless push up to the outside edge of your comfort zone, and then you have to stay there. I was used to hauling out as fast as I could. This strategy wasn’t going to work for me in my sorry condition, or for a long distance event. Then I had to face reality. I couldn’t just eat whatever and train as hard as I wanted. I got educated about patience, nutrition and planning. I was already eating pretty healthy stuff, but I shifted gears, ate at different intervals and consumed basic supplements like vitamins, electrolyte replacements and protein powder. From my wise Coach Chris I learned about negative splits, which I remembered from college track meets. It had always seemed odd to me that the long distance runners would plot out their race time to the lap. When you’re running 200 meters, you don’t plot out anything, you just run like hell. But learning to shift your pace within each element of the race and throughout the course is an important part of expanding your limits and conserving strength for the next big section or the monstrous hill around the corner. Work your body into it and, if you’ve trained well, strength and speed will kick in. You’ll know when to go hard and when to back off. And I wanted all of it to be stress-free. I was still recovering – physically and mentally – and was more afraid of an injury than anything, so I under-paced myself. I wanted to just build up endurance and feel out that frontier, the wild physical edge I hadn’t been near in years. There were moments with my team when I felt a twinge of embarrassment and humiliation when I plodded in long after they’d finished, but they were incredibly supportive and positive. I couldn’t have asked for a greater group of people to make me comfortable with the path I had chosen. When race time came around, I was calm and only slightly nervous. I had trained. I had eaten. And I had everything I needed. The swim started off badly. For some reason, the swell came up on that part of Maui. This was great for surfing, but not for open swims. Within that first quarter mile, I must have swallowed about a half-gallon of ocean water, which I vomited back to the sea along the way. It was a horrible feeling – I knew I could swim faster than I was, but I choked, literally, and spent a couple hundred yards getting back my equilibrium. By the time I got back into my groove, I was already behind the pace I had set for myself. After a few miles on the bike, I felt better. I drank. I ate. I always think of the bike as my snack time. And if Lance Armstrong can eat a PB&J during the Tour de France, I can eat my peanut butter ClifBar and take it easy. I looked over and saw the cliffs of Maui I had just climbed, the towering palm trees, the bright green foliage, and the shimmering sea beyond. It was beautiful and I was on a tropical island competing in an Olympic distance triathlon. I smiled then. How could you not love it? The transition from bike to run was less than 30 seconds. I counted. And even though I barely made the bike cut, I cruised out of there happy to have made it and to finally be on my own two legs. On my way out I saw one of our team captains, Troy, a speedy marathoner who had already finished his race. I pushed aside the fact that he was already done and I still had an hour to go and remembered a strategy he shared with me. I saw everyone in front of me, aimed for them, and ran past them. I ended up walking about half a mile, only because it was blazing hot running through the lava fields and I had to pee badly. But I took down about 20 people at the end and redeemed myself in my own mind. I had done it and finished strong. Nobody could ask for more than that. Any way you look at it, a triathlon is a rough ride. Endurance means learning about yourself and being in your own head for a very long time. You learn about your limits, your fears, your strengths, and your inadequacies. You learn where you can push yourself willingly, and where the race pushes you unwillingly. It’s a tug of war, a compromise with the forces of nature. The reality is that it’s a personal war – a war against fatigue, laziness, stagnation and time. It’s not logical or anything remotely sensible. It’s just about working the machine. Although I chose to gracefully retire from soccer (while I could still be graceful), I’m still coaching, and I have two more triathlons coming up – a sprint and another Olympic distance in October. Now I can finally work on some speed and cutting out that extra hour of “fat time” that I took as a luxury. And every time I swim, or bike, or run, I will hear that voice from the crest of the Maui hill. Love the moment. Live it. Embrace it. Maria Collette Sundeen is a filmmaker, writer and triathlete living in Berkeley, CA. 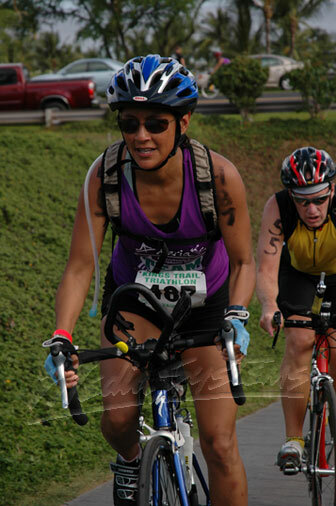 You can read the training blog on her first triathlon at http://ruff-girl.blogspot.com.